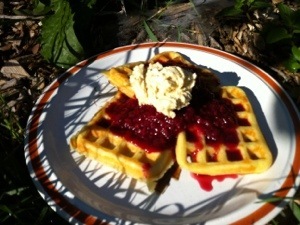 Perfect Gluten-Free Waffles, light and crispy. I get very excited when I discover a new recipe that is super satisfying and full of real ingredients like eggs and butter. It’s been years of eating satisfactory waffles until this week! Let the batter stand and it will be thick and this is good! Cook until golden and perfect. If you freeze on a cookie sheet and then bag, it makes it convenient to grab one or two for a quick snack or meal.